Warm summer weather makes people across Manitoba think about staying cool. Year after year, they flock to swimming pools or natural bodies of water across the province to get wet and beat the heat. Unfortunately, that also means that every year we see a spike in drowning deaths. To raise awareness about drowning prevention, the Lifesaving Society designates July 15-21, 2018 as National Drowning Prevention Week (NDPW). In Manitoba, approximately 26 people die a year from drowning. If you’re not within arms’ reach, you’ve gone too far. Always supervise children. Never leave children alone near water and always keep them in your sight. If children are at the water’s, edge a responsible guardian needs to be with them. If you turn your back to answer the phone or respond to a text message your child could be gone forever. Whether at the beach or in a pool or hot tub children can get into trouble very quickly and can slip under the water very quietly without shouting and waving. In Manitoba, 80% of children under 15-years-old who died due to drowning were alone near water, and in 87% of such cases adult supervision was found to be absent or distracted. Boat sober. Alcohol consumption is a factor in 75% of boating-related fatalities. In Manitoba, alcohol consumption is a factor in 75% of boating-related fatalities, higher than in other provinces. The consequences in Manitoba for impaired boating and impaired driving are identical. Leave the booze at home; it can lead to disastrous consequences on the water. Choose it. Use it. Wear a lifejacket! 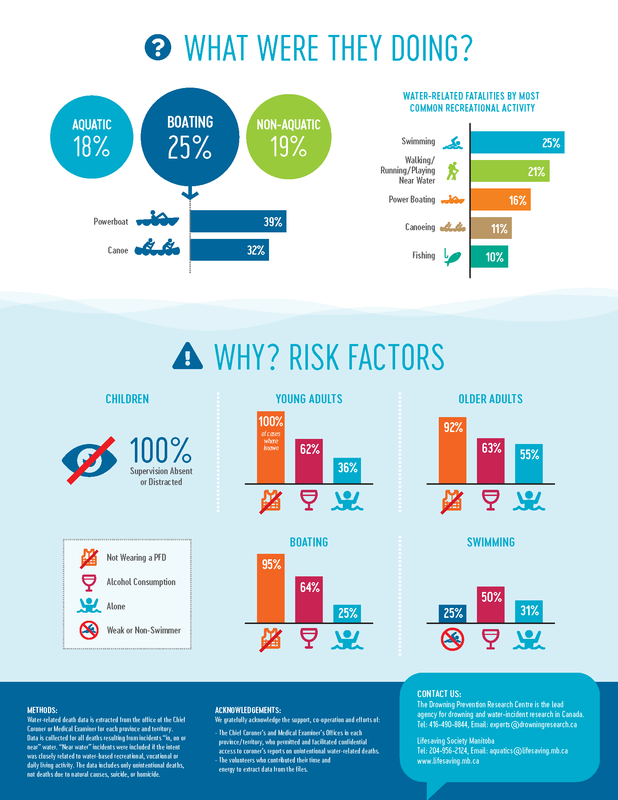 Not wearing a lifejacket or PFD was a factor in 100% of boating deaths in Manitoba. Lifejackets must fit properly and be in good working conditions. Buckles and zippers should be functioning and intact. Everyone should wear lifejackets while boating and anyone who cannot swim – especially young children – should wear a lifejacket while swimming. Lifejackets don’t work if you don’t wear them. Learn More about Lifejackets. 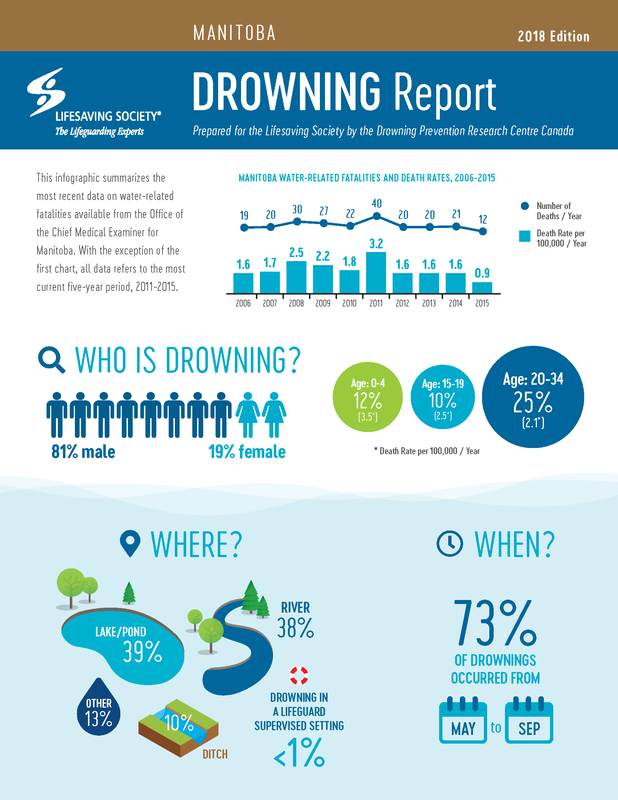 Download the latest version of the Manitoba Drowning Report or click the images below. Download these resources to host a National Drowning Prevention Week event at your pool or community facility! For more information or for assistance with planning events, please contact the Water Smart® Coordinator. Affiliate Members are welcome to use the National Drowning Prevention Week logo on their materials and resources. Please read the Visual Identity Guidelines to ensure the logo is used properly. 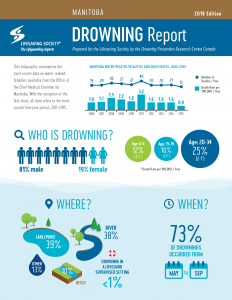 The Lifesaving Society – Manitoba Branch, along with Lifesaving Society Canada’s Public Education Commission, has put together Social Media Messages and Drowning Prevention Themes to emphasize during the 2018 National Drowning Prevention Week. Affiliate Members and supporters are encouraged to use these messages on social media between July 15 and 21. The Manitoba Branch will also be sharing these messages on social media. Don’t forget to use the hashtags #NDPW2018 and #SNPN2018. The proclamation letter and template can be shared with your local communities.